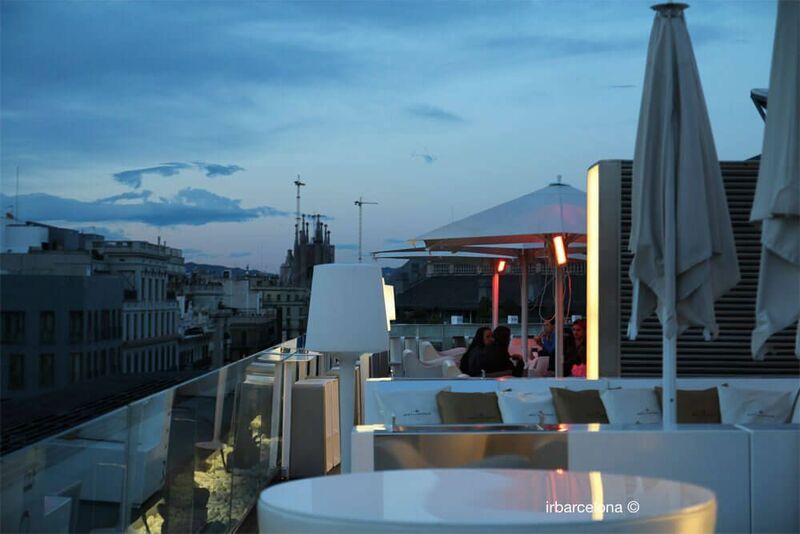 Every year when the good weather arrives, the Barcelona rooftop terrace season unofficially starts. Around 50 of the city’s hotels offer the possibility of relaxing in these magnificent spaces throughout the warmer months. 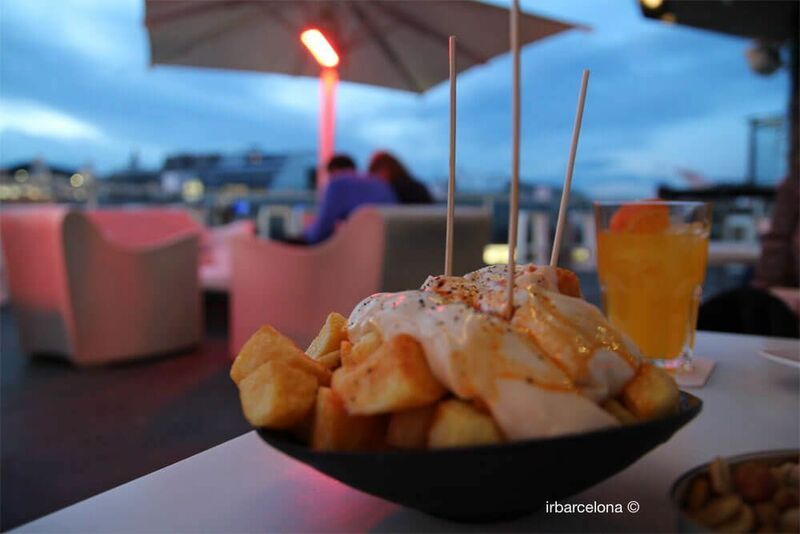 It’s no secret that over the past few years it’s become fashionable for hotels to open up their terraces not just to residents but also to anyone who would like to enjoy a lovely evening whilst enjoying, in the majority of cases, some great views of the city of Barcelona. From nearly 50 hotel terraces that have opened their doors to the public in 2018, we have given you more detailed information about around 20 of them. We have given you their addresses, opening dates and times, and information as to whether they have a restaurant or other complementary facilities. Open all year round (except January). Summer (May to October): every day from 12:00 to 02:00. Winter (November to April): Wednesdays to Sundays from 17:30 to 02:00. Burgers, pizzas and a selection of tapas. Soft drinks, cocktails and various alcoholic beverages. c/ (street) Passeig de Gràcia, 73 (8th floor). Every day from 11:00 to 02:00. Set menu and extended menu (from 13:00 to 15:00 and 20:00 to 23:00). Soft drinks, cocktails and alcoholic drinks. DJ sessions on Saturdays from 21:00 to 01:00.
c/ (street) Pau Clarís, 150. TEvery day from 11:00 to 02:00 (in summer breakfast is also served between 09:00 and 11:00). Tapas, burgers, pizzas, salads and fish (from 13:00 to 17:00 and 18:30 to 23:00). c/ (street) La Rambla, 109. From Sunday to Wednesday from 12:00 to 02:00 a.m. and from Thursday to Saturday from 12:00 to 03:00 a.m. Various selections of snacks to share. The bar specialises in sophisticated cocktails. Live chill-out music is sometimes organised. c/ (street) Passeig de Gràcia, 132. Daily from 19:00 to 01:00. Cocktails, cava, gin & tonics and other alcoholic drinks. On Sunday evenings there’s usually a live jazz group playing. c/ (street) Via Laietana, 49. From Sunday to Wednesday until 0:00. Thursday, Friday and Saturday until 02:00. Selection of tapas, snacks, sandwiches and salads. Soft drinks, wine, gin tonics, cocktails and other alcoholic beverages. Daily from 10:00 to 02:00. Burgers, tapas, salads, sandwiches and oriental snacks. Soft drinks, wine, cava, cocktails and other alcoholic beverages. Chill-out music in the background. Daily from 11:00 to 19:00. Soft drinks, juices and cocktails. pl/ (square) de Llevant, s/n (8th floor). Monday to Friday from 8:30 to 22:00. The restaurant serves a wide variety of good food. Music nights (during the summer). Monday, Tuesday and Wednesday from 12:00 to 00:00. Thursday, Friday and Saturday from 12:00 to 02:00. Sunday from 12:00 to 22:00. Snacks, tapas, oysters, salads etc. Soft drinks, cocktails and a wide variety of beverages. Chill-out area in the evenings. c/ (street) del Rosselló, 249 (6th floor). Tuesday to Thursday from 17:00 to 01:00. Friday and Saturday from 18:00 to 01:00. Sandwiches, tapas and oysters etc. Cocktails and gin & tonics. Events are organised on an ad-hoc basis. 360º degree panoramic view. c/ (street) La Rambla, 105. Daily from 18:00 to midnight. Saturdays and Sundays until 01:00. Wide variety of drinks available (cava, wine, cocktails…). Live concerts and DJ sessions are organised. 360º degree panoramic view. Rambla del Raval, 17-21 (11th floor). Opening times to be confirmed. Soft drinks, cocktails and a variety of beverages. Cocktails and all kinds of drinks. From Thursday to Friday: DJ Sessions, Jazz & Soul and live music (depending on the day). Opening hours vary according to the time of year. Tapas, salads and small dishes. DJ sessions are often organised. Monday to Wednesday, from 19:00 to 02:00. Thursdays until 03:00. Fridays and Saturdays until 04:00. Oriental food and other options. Wide variety of drinks (especially alcoholic). pl. (square) de la Rosa dels Vents, 1 (ground floor). Monday, Tuesday and Wednesday from 12p.m. to 0:00. From Thursday to Sunday from 11p.m. to 01a.m. and Saturdays and Sundays until 03a.m..
Cava, wine, beers, a variety of alcoholic beverages, soft drinks, coffee etc. c/ /street) Passeig de Gràcia, 38-40 (azotea). Daily from 16:00 to 20:00.
c/ (street) Passeig de Gràcia, 38-40 (planta baja). Terrace open throughout the year. October to April: from 10:00 to 20:00. May: from 10:00 to 22:00. June to September: 10:00 to 02:00. Soft drinks, cava, wine, gin & tonics and other alcoholic beverages. Events are organised on an ad-hoc basis. c/ (street) Passeig de Gràcia, 68. Open daily from 18:00 to 00:00. Burgers, sandwiches and a selection of tapas. Cocktail menu, and a selection of alcoholic drinks. Acoustic concerts (jazz, funk, pop etc), and DJ sessions. Open daily from 12:00 to 22:45. Wine list, gin & tonics and cocktails. From April to October 9pm to 1am for the public. From November to March from 5pm onwards. Price €20 for non-guests (includes a cocktail). Main courses, salads, tapas, sandwiches and snacks to accompany drinks. International cocktails and a good selection of drinks. They usually play good music. c/ (street) Via Laietana, 30. 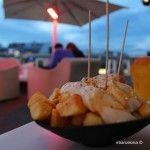 From October to March: from Monday to Saturday from 17:00 to 00:30 and Sunday from 16:00 to 23:30 (heated terrace during winter). From April to September: From Monday to Wednesday from 17:00 to 00:30. From Thursday to Saturday open longer until 01:30. Sunday from 16:00 to 23:30. Alcoholic and alcohol-free drinks. They also specialise in cocktails. They organise one-off events and some leisure activities. To be sure of the opening days and times beforehand, it’s always best to call the hotel you’re going to, or check the website. We have therefore included the phone number and email addresses of the hotels that we recommend. 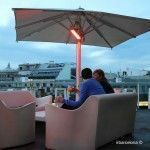 In general, and providing they aren’t reserved for private functions, access to the hotel terraces in Barcelona is open to everyone and is free of charge. To enter them, there’s really no need to get dressed up, but we do recommend not turning up too scruffy, just in case you’re refused entry. IS IT NECESSARY TO MAKE A PRIOR RESERVATION? If you’re just going for a drink it shouldn’t be necessary to reserve in advance (but if you’re with a large group then perhaps it is advisable). If you’re planning to eat at lunchtime or in the evening, you will need to make a prior reservation, especially if your visit is during the weekend. You can usually either email or phone the hotel to make your reservation. 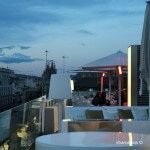 With a few exceptions, such as that of the terrace of the Hotel Claris, which is heated, the hotels generally open up their terraces in mid-spring, with the arrival of the warmer weather, and stay open throughout the summer. The majority of hotels that open their terraces in summer do so every day of the week, although some only open on Thursdays, Fridays, Saturdays and Sundays. To attract more people, many hotels put on events such as live music, from jazz to house, and perhaps even a grand piano playing in the background. Collaborative events are also organised, such as the “Setmana de les Terrasses dels Hoteles” (the Hotel Terrace Week), in mid-May to early June, and A Vista d’Hotel and Vespres Inedit’s (a series of free concerts), throughout the summer. The opening days and times of the terraces are decided by the hotels, but in general those that open during the week close at around 23:00 or midnight (with access being restricted a few minutes before closing time). During the weekends opening is extended until around 1am or 2am. 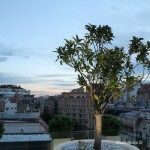 What can we expect from the hotel terraces? 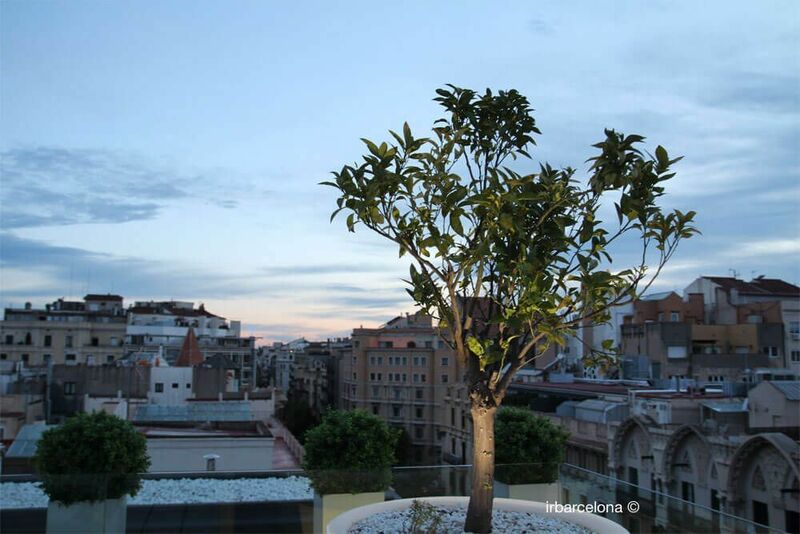 Barcelona’s various hotel terraces have all sorts of charms, some of which are common to all of them, but some are unique to each one. We therefore recommend that you go to more than one of the hotels during the summer months, to fully enjoy what they have to offer. The panoramic views that can be enjoyed from some of the rooftop terraces are one of the main reasons that the locals go to them, as you are able to see the city from a unique perspective that can usually only be seen from the terraces. Although it goes without saying, we should also point out that the views at night are completely different from those during the daytime, and as we think sunset is one of the best times of day to see the panoramic views, why not arrive in time to watch the sun go down, so that you benefit from both the daytime and night-time views. 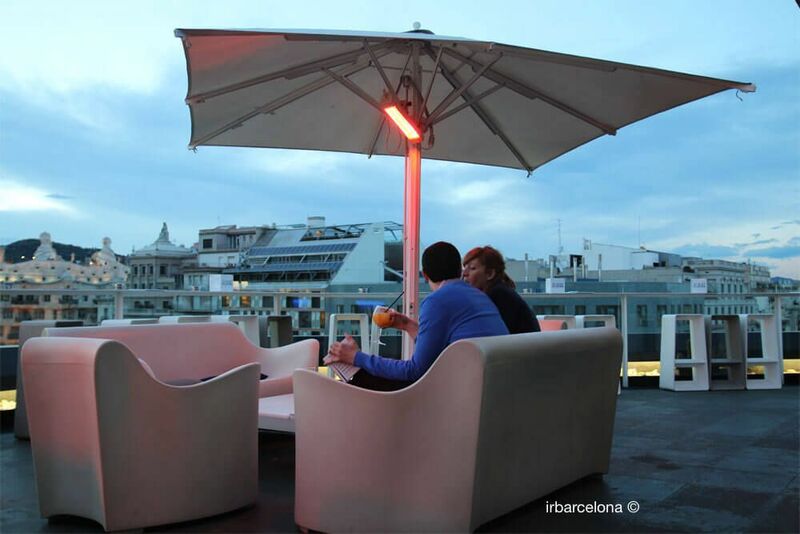 There’s really nothing better than enjoying a relaxing drink whilst watching a bright city such as Barcelona begin to take on an intense golden hue, then in just a few minutes becoming dark, but lit up by the city’s bright lights. Nearly all of the hotel terraces have lounge areas with sofas, and sometimes, as is the case with the Hotel 1898 or in the W Barcelona, there are even loungers on which you’ll be able to lie down whilst enjoying a drink or two. Although not always the case, it’s quite common for the evenings and nights to be livened up with live music performances, whether it’s relaxing jazz, pop or chill-out, or more up-beat music to give the evening a livelier feel (techno, house, DJ sessions etc). As well as being able to enjoy a drink and a light snack, whether it’s breakfast or a cocktail, many of the hotels also have a restaurant service on their terraces and you’ll be able to have lunch or dinner there. Although you’ll find that they might be a bit pricey, we think that in this case it’s worth treating yourselves! Some hotel terraces have swimming pools, but their use is generally reserved for residents, so before turning up at the hotel in your bikini, best check in advance!